This is another interesting piece of vintage jewellery in my Etsy store. I think that this might be a unique piece and Continental in origin - as it does not have a traditional British hallmark. 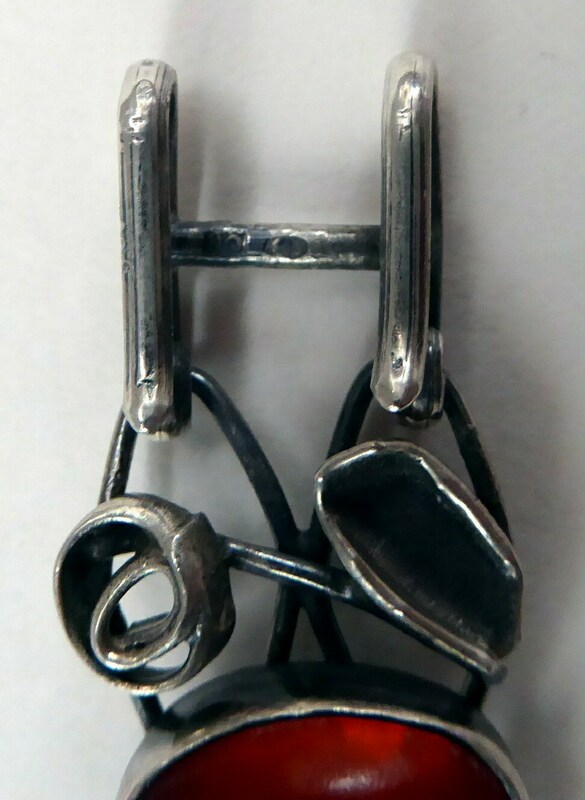 There is a maker's mark on the back of the bar which holds the hooks used to close the braclet: it is quite a small mark and it reads as follows: NO (contained in a square lozenge; this might be an abbreviation for Norway) - then there is an indecipherable symbol and finally the number 3. Anyway, it seems to be a rather unique vintage designer made piece - and on stylistic grounds it looks as if it dates to the 1960s or early 1970s. 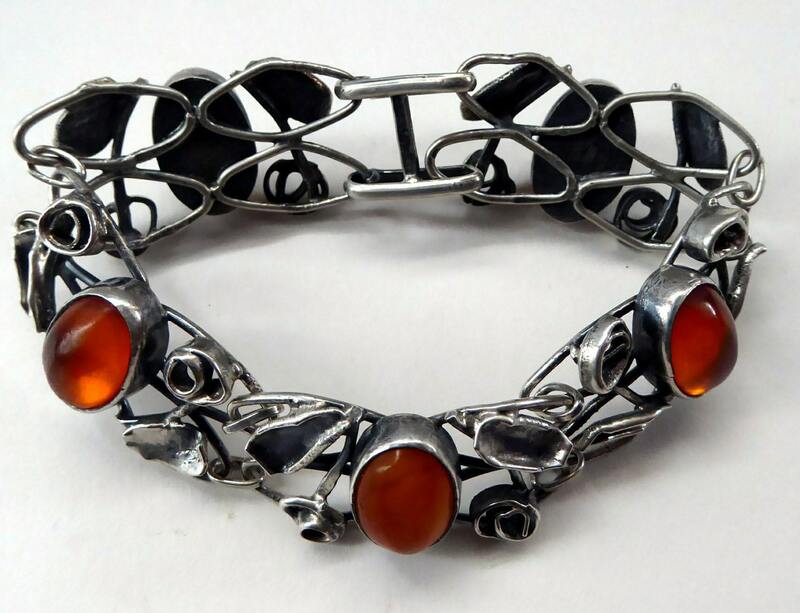 The bracelet is made of five linked sections - each section has an oval amber cabouchon, deep set into the centre - and on each side two foliate decorations, which I think look slightly like Glasgow Roses. These are near identical along the whole length of the bracelte. As you can see in my images - certainly a very attractive craftsman made piece. 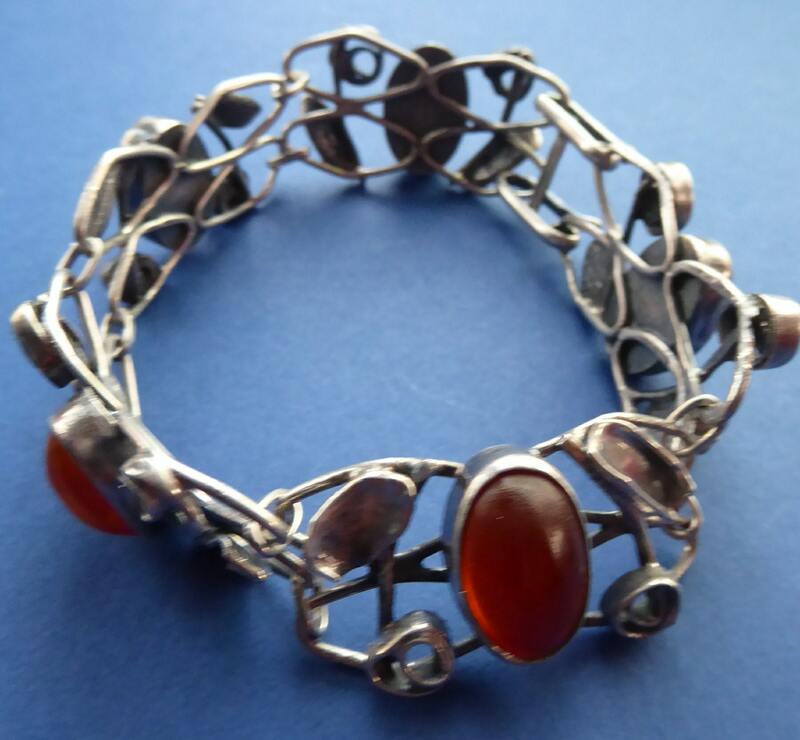 Some natural darkening to the silver - which gives the bracelet a fine patina of age. It has been cleaned before sale. It is quite a large and heavy bracelet with a diameter of about 7 1/2 inches - and it certainly would fit a larger person. Probably not for a slender wrist. As you can see from my photographs - a quite unique piece and well made. If it is a vintage Norwegian piece - then probably a nice bargain for someone. HAPPY TO POST INTERNATIONALLY, PLEASE ASK FOR A POSTAGE QUOTE TO SEND OUTSIDE OF THE UK.